Yes, Health Departments in almost all states and/or localities require juice manufacturers to register with their office. 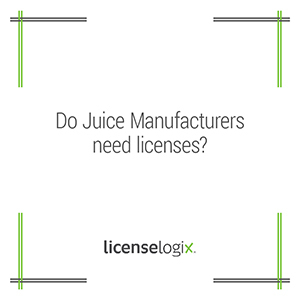 Juice Manufactures are subject to food permits and inspections similar to those administered to restaurants. In addition to a food permit, States, Counties, and Municipalities may require business to obtain a local business license and other zoning approvals. Licenselogix can identify all the licensing requirements your business may need and file the forms on your behalf. A Juice Manufacturer wishing to do business in Florida will need to obtain an “Annual Food Permit” from the Florida Department of Agriculture and Consumer Services. If they plan to distribute their product at the same facility they would also need an additional permit in order to do so. These permits require the facility to submit a plan review to the board for approval and undergo inspections before being allowed to operate. Additionally Florida cities and counties require a local Business Tax Receipt for any business operating within the city and county limits. In Texas Juice and Food manufacturers are required to register with the State Department of Health Services prior to operating their business. Manufacturers must have their facilities inspected and pass zoning rules before being allowed to open. In addition to Local and State Licenses, Juice Manufacturers, should review the FDA’s Juice Hazard Analysis & Critical Control Points (HACCP) legislation to see whether their business falls under the rules and regulations of this act. Depending on the type of business, quantity of juice being produced, and type of fruits or vegetables in the juice there may be rules imposed by the FDA. Licenselogix can assist your new or expanding business obtain all applicable business licenses and your business stays in compliance will all license regulations. For additional help you can fill in the form on the right or give us a call at (800) 292-0909.